Every other year, I repeat this posting with updated links and ideas, as its message is still relevant. And now, more than ever, humanity and the planet need attention. On July 4th, 1776, 56 of our forefathers signed the Declaration of Independence. We celebrate our independence day with fireworks, parties, barbecues, carnivals, concerts, public speeches and family reunions. Can we lessen our carbon footprint on such a day and still have fun? We not only think we can, we believe it is imperative that we do. The Popes Encyclical and the Dalai Lama‘s position on climate change can no longer be ignored by the 321.2 million Americans that celebrate this holiday. Today, Americans will ingest 890 million pounds of beef, pork and chicken and 155 million hot dogs. Imagine the impact of all the refuse from those events, the fireworks, and the carbon footprint of all those burgers, hot dogs and steaks. This week’s practice is to become independent from our current cultural conditioning by shifting to a more sustainable holiday tradition, remembering the true spirit of the Declaration. Read the sustainable version: The Sustainable Declaration of Independence, an adaptation by Dr. Susan Krumdieck, 2008. (Transition Committee of Oamaru, NZ) Consider helping your community adopt this statement. Buy reclaimed wood furniture for your outside recreation areas. 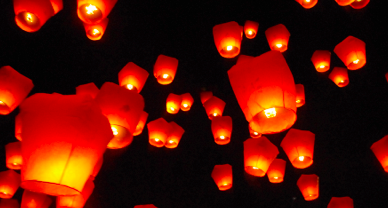 Try Eco Sky Lanterns instead of fireworks; they are simple to launch and create an amazing spectacle in the night sky. Consider using public transit or cycling to your July 4th event. Having a vegetarian Independence Day limits your GHG/carbon impact. Several great menu’s can be found on the Healthy Happy Life, the Vegetarian Spotlight, Cooking Stoned, or the MisoVegan. Instead of ice cubes, consider the Scottish way of cooling with On the Rocks Drinks Chillers. Recycle, repurpose any waste and/or compost any leftovers. Let us know how what sustainable ideas you practiced this holiday on twitter, (tag us at @terrabluteams, Facebook , comment to our founder on Instagram at @sustainablestruck or comment here. Reclaimed wood outside dining pieces can be found here and here. This entry was posted in Holidays, Sustainability and tagged Independence Day, July 4th, Sustainable Declaration of Independence, sustainable holidays by terrabluteams. Bookmark the permalink.